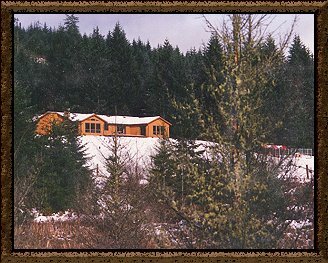 At home Trifecta sits on a hill overlooking the private Valley of the Crow. Completely surrounded by woods it is a quiet place to train and play. My goal is to teach dogs and owners to enjoy working. 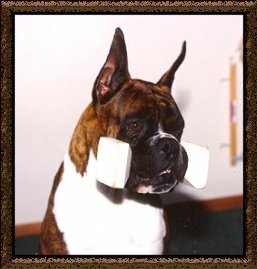 I have done a lot of competitive obedience with my Boxers. Putting advanced titles on three Boxers. 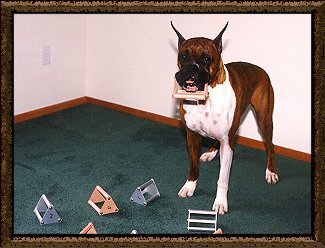 Each one of my competition obedience boxers earned two titles. Companion Dog and Companion Dog Excellent. Teaching dogs to enjoy what they are doing regardless of the venue is super important to me. I specialize in training companion, performance and conformation dogs. All dogs need and can have manners. With different dogs and people the needs and goals will be slightly different. Companion (pet) dogs need to be well mannered. 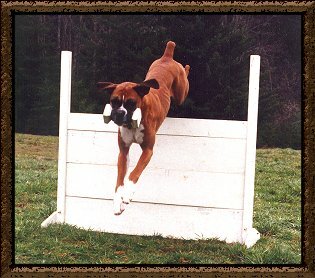 Performance dogs need confidence, conformation (show) dogs need attitude, confidence and manners. Rewarding their efforts regardless of the training focus creates a confident thinking dog that enjoys working or being a great dog citizen. Reconditioning is also specialty of mine. Dogs who have soured on, or are afraid of life or doing their work gain confidence from my type of training. Throughout all training I stress behavior. A dog needs to be easy to live with and travel with. Good behavior is not contrary to a great performance or working attitude. References from owners and handlers available. The link below goes to the official Trifecta Training Center Page. 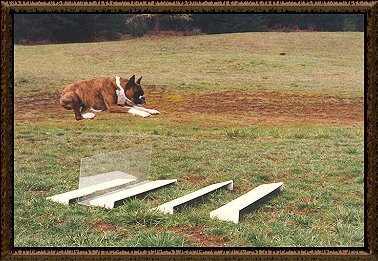 The page goes into detail regarding training all breeds techniques and philosophies.